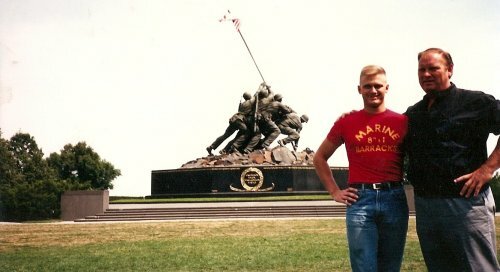 Marine Barracks in Beirut, Lebanon can be found here. 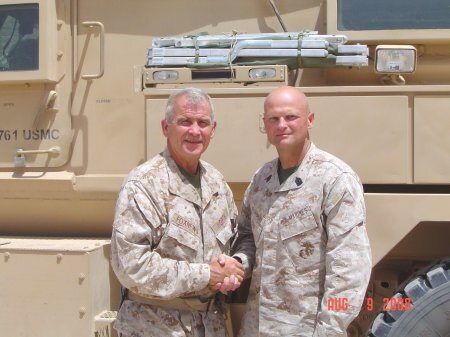 To see an interesting article "No One Drills Like 8th & I Marines," click here. 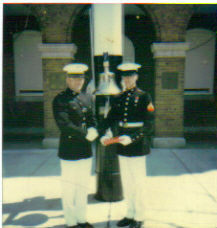 To see "Pass In Review" for February, 1988, click here. 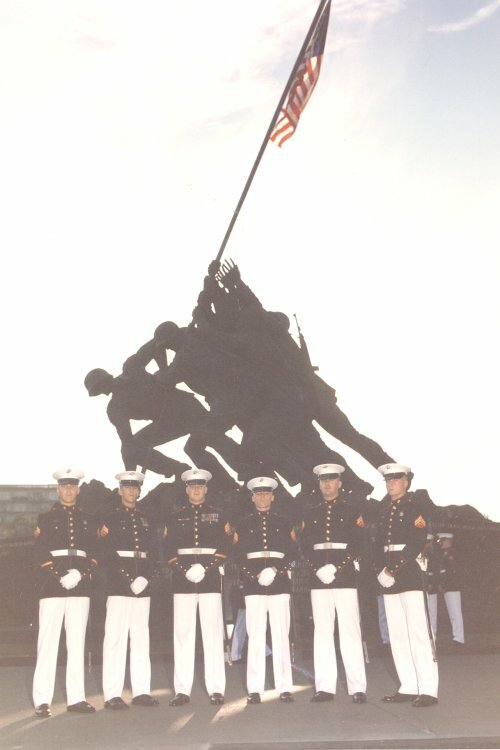 The see the parade program for 17 June, 1988, click here. 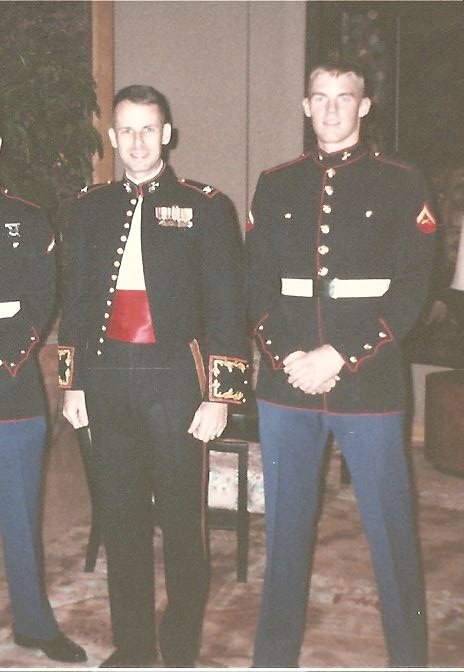 Peter Pace at the 1989 Marine Corps Birthday Ball. 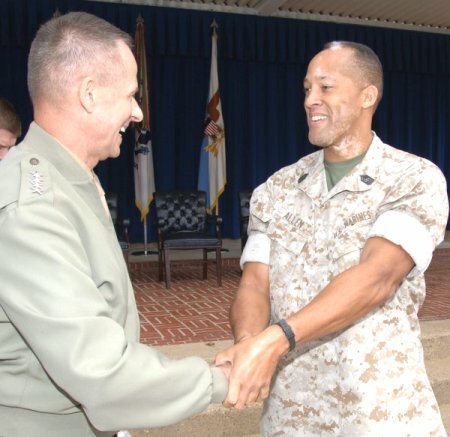 MGySgt Allen with Gen Peter Pace at his "farewell to the troops" ceremony. 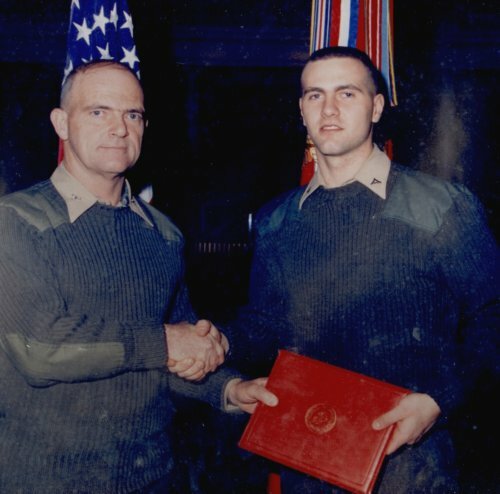 Gen Pace was CO of Barracks when MGySgt Allen served there in 1988 as the White House NCOIC. Members of H&S and MCI Companies who served as greeters, hosts, security, etc. 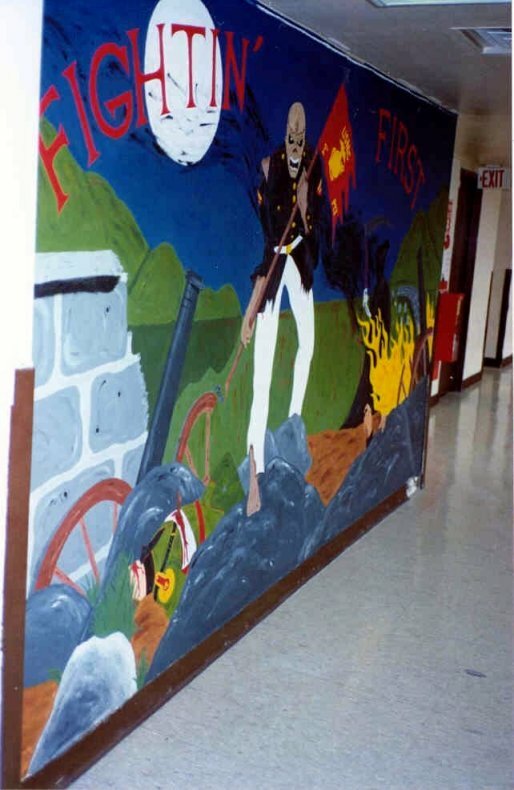 for Barracks Evening parades in 1988 and 1989. 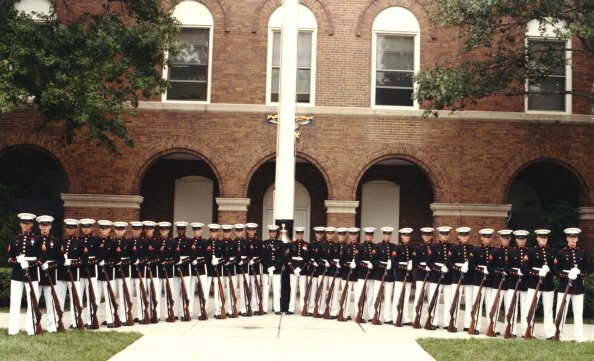 The Drill Team in March 1989 at Corpus Christi, Texas with the SgtMaj of the Marine Corps (SgtMaj David Sommers). 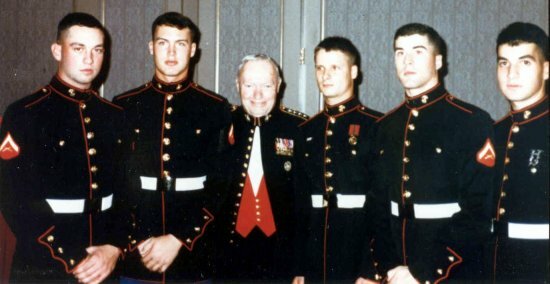 Standing second from left is Moser, first kneeling is Eric Carlson, fifth person standimg from left is Lance Cpl Frederick (Rifle inspector for 1991), standing behind SgtMaj David Sommers (on HIS right) with just his face is Mark Nicol, and over SgtMaj left shoulder is Joey Carlson. 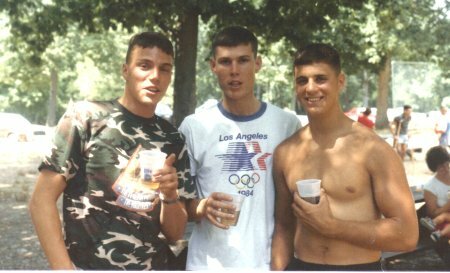 #1 is Mike Hastings, and #3 is Brian Avery. 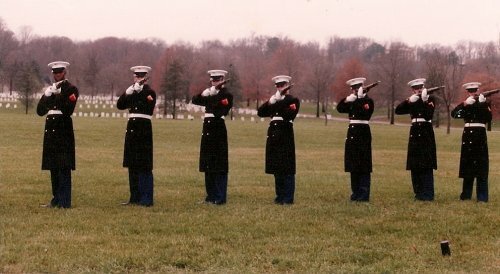 A Co, 2nd Platoon practicing at the Iwo Jima Memorial for the Sunset Parade in 1988. Albert Meyer-Pflug in the 1-3 position, and Mcbride is 1-4. 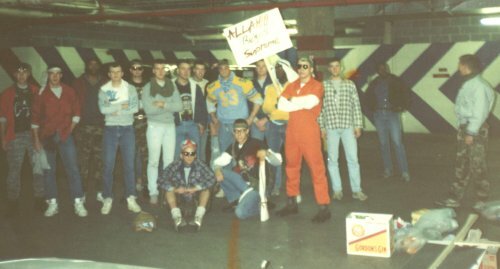 From Albert Meyer-Pflug: A Co, 2nd Platoon group shot as we head to Quantico for Riot Control Exercise sometime in 1988. 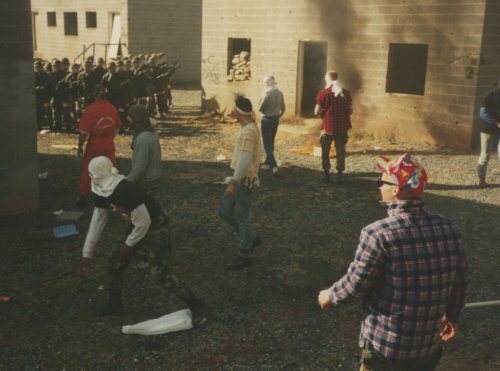 We got to play the bad guys and B Co were the Marines who cleaned up combat town. 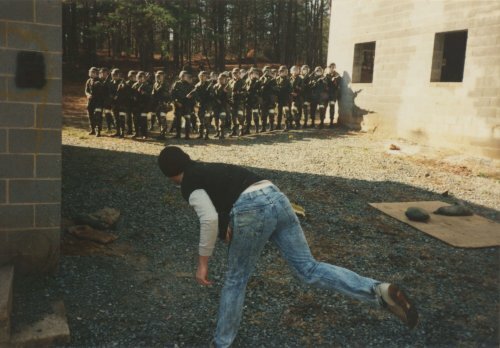 One of the best training experiences I had while at 8th&I. 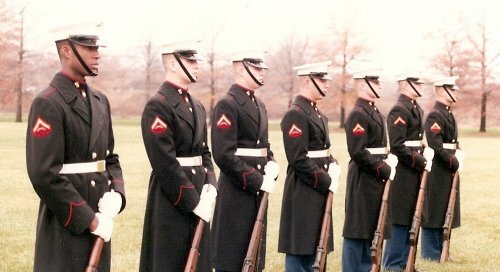 I tried to remember all the Marines in the picture but came up short on a few of them. 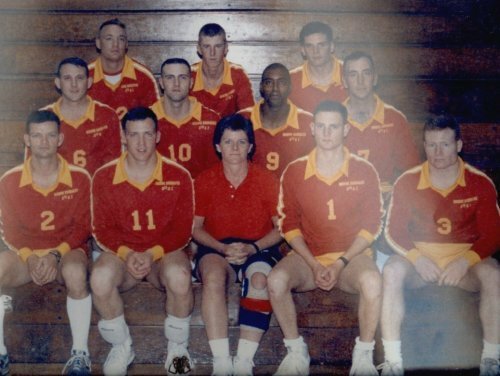 Top Row: Unknown, Vresh, Unknown, Brookshire, Unknown, Covert, Bladen, Unknown, Unknown, Hedger, Unknown, Unknown, "Bangor" Lang, Alves, SSgt ?, Smith; and Front Row, Unknown and myself. 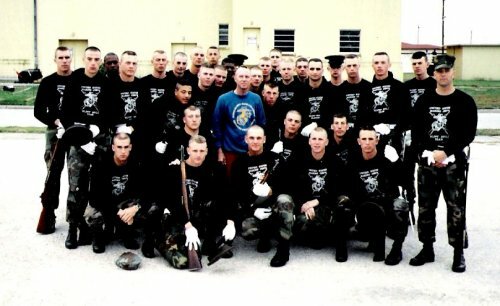 B Co Marines in formation and ready to clean up combat town in Quantico. 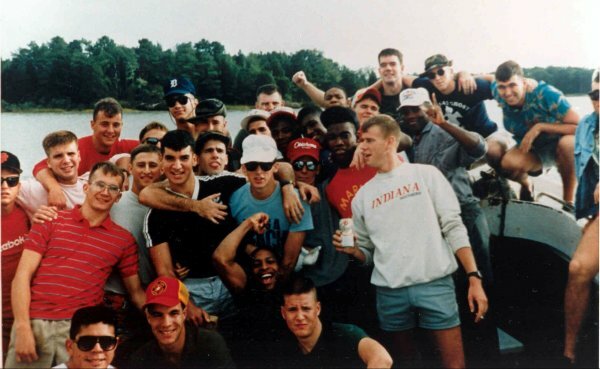 Here's our platoon causing all sorts of mischief for the B Company Marines. 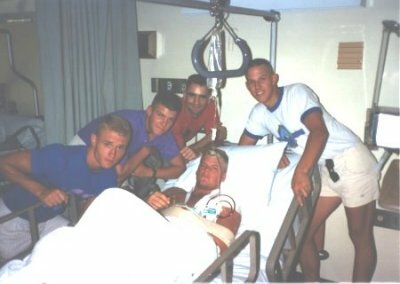 Visiting Chris Harper at Bethesda Naval Hospital following shoulder surgery. 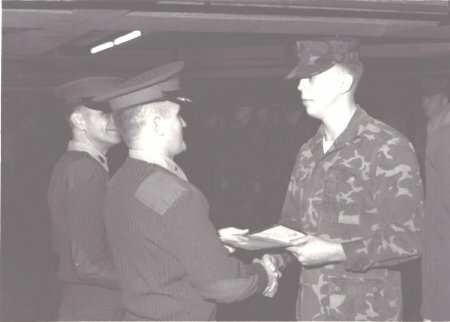 Gary Taylor receiving his Meritorious Promotion to Corporal in early 1983. 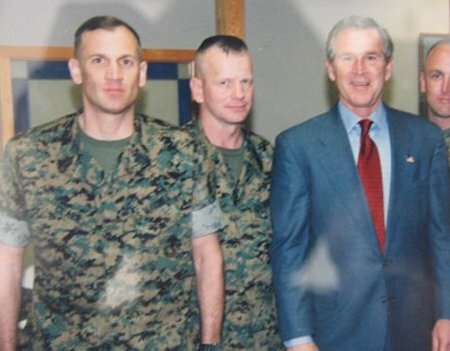 Security Company, and President George W. Bush. 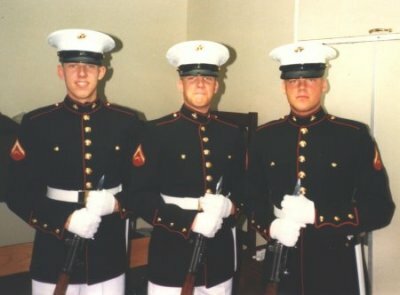 Photo taken in Apr 2003 at the 6th Marines Chow Hall just after the invasion of Iraq. Bicentenniel of George Washington's February 21, 1789 inauguration as President. 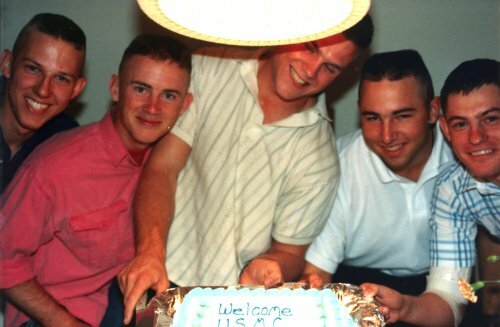 Can anyone help ID the unknowns? 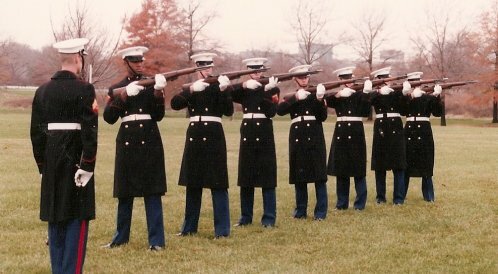 In 1982, actress Lynda Carter of Wonder Woman fame performed in an evening special with the Silent Drill Team. 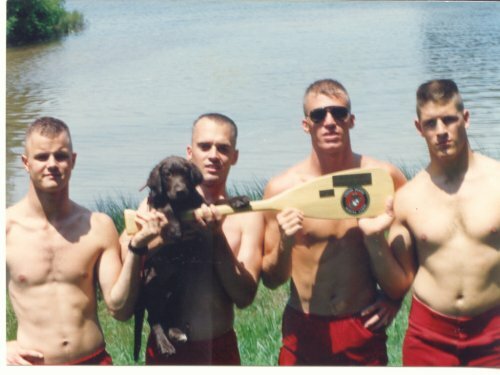 At the time the team was in training at MCAS Yuma, AZ. We were flown to Hollywood for a few days to film the sequence at either MGM or Universal studio, I don't remember which. I always wished that I had gotten a recording of the show. 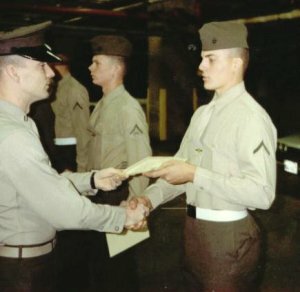 I was a PFC at the time, and was fortunate that I made the tryout. My wife recently found the video on youtube, so here is the link. I remember where I was, even though it was 31 years ago because I almost cut Lynda when she came out from backstage while eight of us were doing the meat grinder. We practiced with a stand-in the day before filming and she didn't give Lynda enough information. Lynda walked right between Steve Barker and myself while we were spinning our rifles. Good thing it wasn't live! Thanks John - pretty cool! 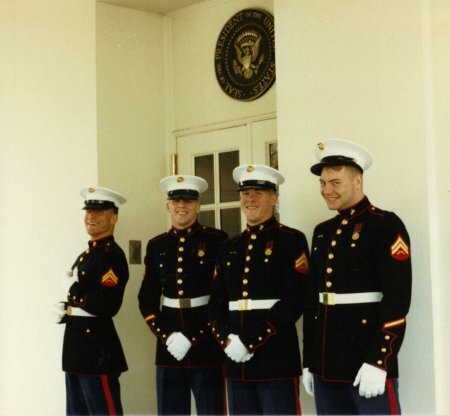 BTW - this may be of interest - I was on a Marine Band "patriotic opener" job on March 30, 1981 at the Washington Hilton playing for a gathering of the AFL-CIO at which President Reagan spoke and was than shot as he left the building. It was a cold rainy day and several of us had worn overcoats and of course had instrument cases that had to be collected after we were released, which added a little time for us to get to our bus. As we came out into the lobby, we were aware of an unusual level of activity - all the pay phones were being used and people seemed to be hurrying everywhere. 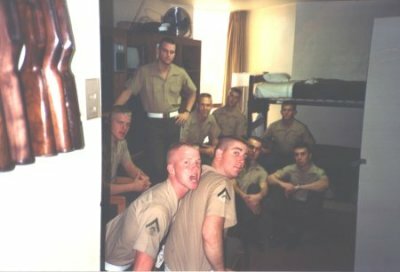 We went out the doors to walk to our waiting Marine Corps bus and heard that there had been a shooting. The first members of the Band that exited the building actually saw the limousine disappear around the corner headed for the hospital. At this point, Press Secretary Brady and the Secret Service officer and the DC cop were still lying on the sidewalk. 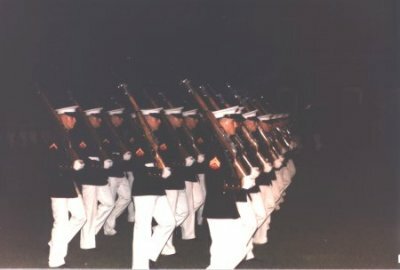 The Secret Service already had rope lines up for crowd control and were all carrying weapons, several of which were Uzi's. The Drum Major told us to get on the bus and wait. 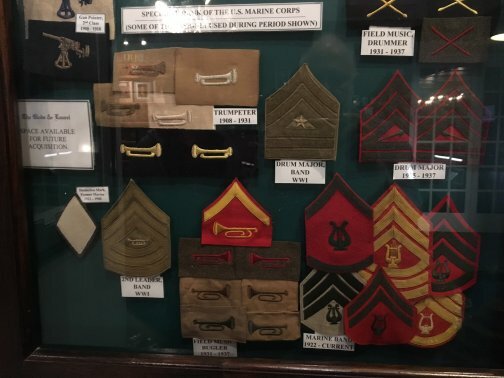 Our driver, a young Marine Corporal or Lance Corporal had witnessed the entire event and had slid down alongside the engine hump to avoid being hit by any stray bullets that might come that way. As we sat there waiting to get the go-ahead, several of the press corps saw our bus, realized that there was a witness on board and headed in our direction. So the Drum Major closed the door and said to the driver, "Drive." 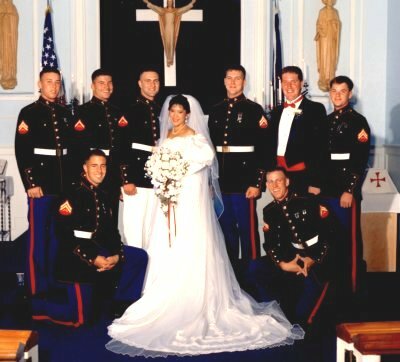 On the way back to the Barracks, the conversation on the bus got around to "where were you when Kennedy was shot?" 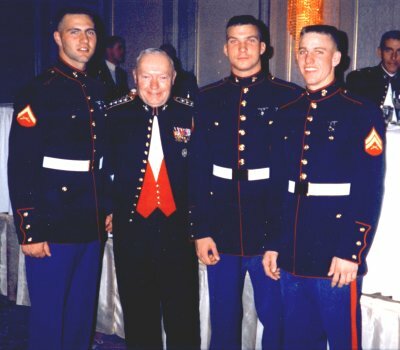 One of the group - a flute player from Texas named Les Hunt had been in the crowd along the parade route leading up to the Book Depository and had waved at the President just minutes before he was shot. Just as a post script, years later I was called to tune a piano in the chapel room on the 3rd floor of the St. Elizabeth's Hospital pavilion where John Hinckley was held until recently. Just being in a building that housed the criminally insane was very intimidating. I don't know if you have seen it, but there's a made-for-TV movie that premiered this week on the National Geographics channel called "Killing Reagan", named after the book of the same name by Bill O'Reilly that is a fascinating look at the events that led to Hinckley's act. Check it out at http://www.imdb.com/title/tt5059126/ .